I like to change up our Christmas decor a bit each year by moving things around and making new vignettes. But, this year I really wanted to change it up a lot and decided to go in a whole new direction in our family room. I have used the same decor for several years and was really wanting a new look. So, before Thanksgiving, I started looking around and getting some ideas. 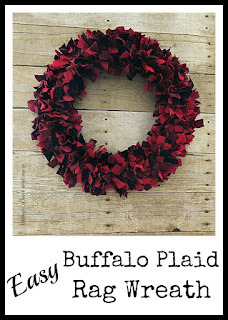 I fell in love with red and black buffalo plaid fabric and if you've been following me you've seen a couple of projects I've made using it already. 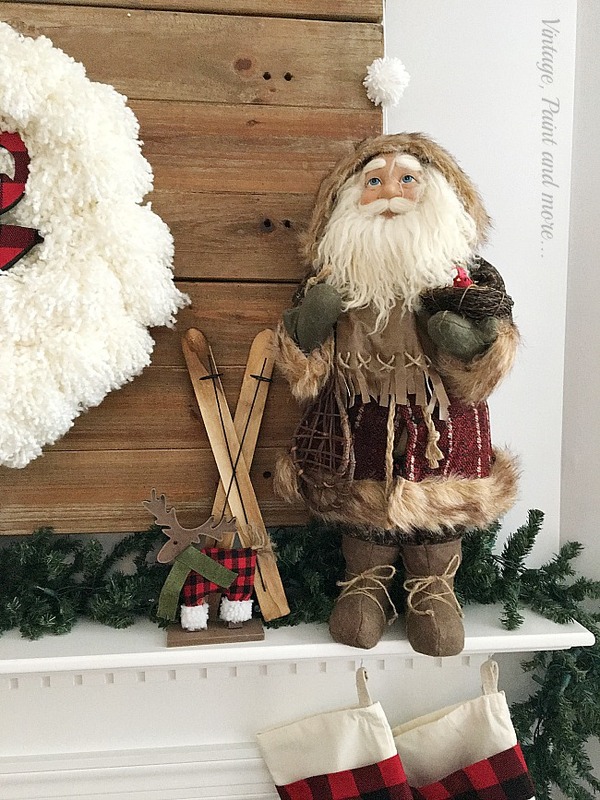 So, I built my family room Christmas decor around that fabric and today I am going to share my Rustic farmhouse Christmas mantel with you. 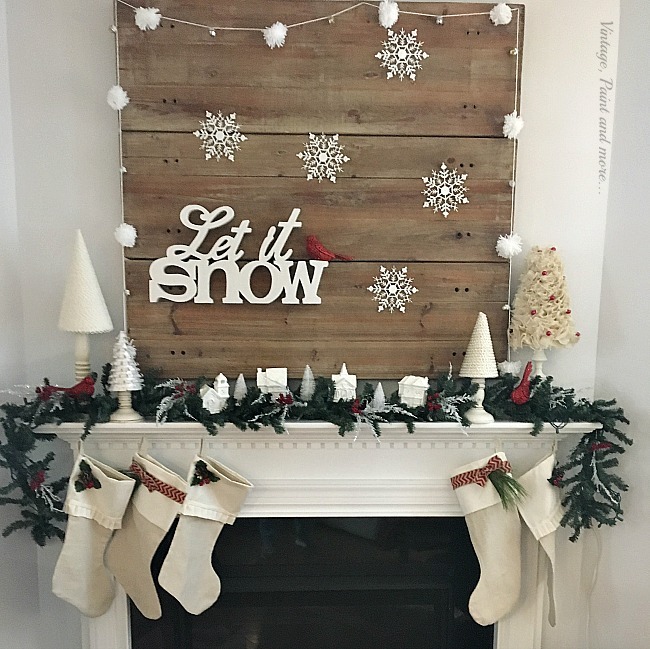 This year's Rustic Farmhouse Christmas mantel is quite different from last year's Let It Snow Mantel as you can see below. This was an easy transition from the all neutral to the colorful mantel with a few easy projects and reusing some of the same elements I used last year. The items I didn't use have been "recycled" to other vignettes throughout the rest of the house. 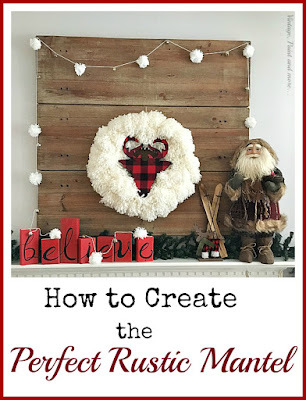 Let me walk you through the changes I made to turn the Let It Snow Christmas mantel into this year's Rustic farmhouse Christmas mantel. First of all, I'd like to go over the elements I reused. 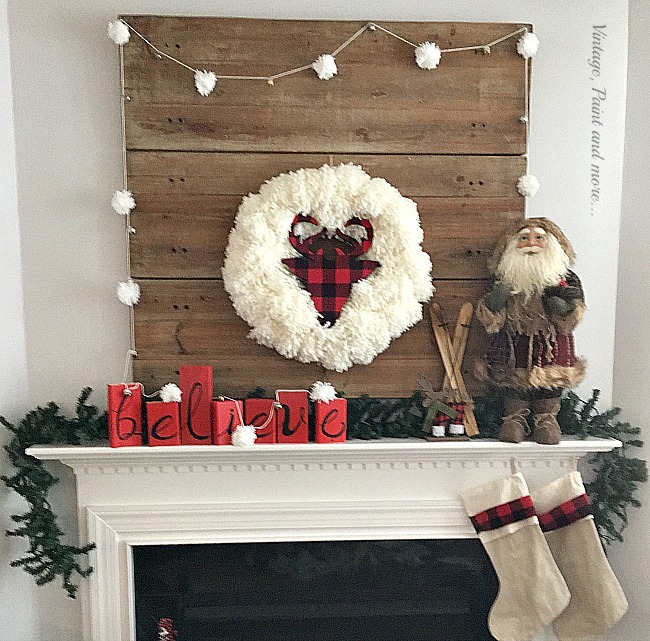 The wood backdrop is a staple to our mantel and is used year round - so, of course, it was going to be part of this year's mantel and fits in quite well with its rusticness. I reused the pom-pom garland I made last year - simply by making some little yarn pom poms and tying them to twine along with jingle bells to create a semblance of snowballs. I also reused the "faux" green pine garland with fairy lights but pushed it to the back of the mantel against the wall so the rest of the elements were out front. So with those pieces we have the background to showcase the rest of the pieces. 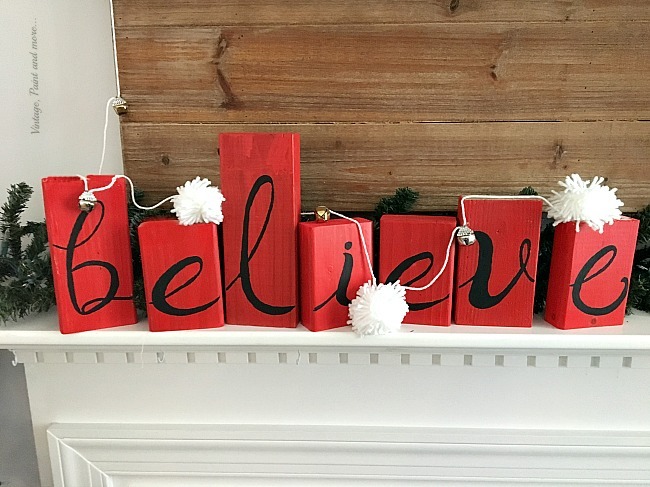 The first DIY project is this cute little BELIEVE sign I made this year. This is a simple project that I made with some pieces of 2x4 left over from other projects. They were scattered over the garage and needed a purpose so I gave them one. It's a simple project that can be done in no time - I'll be sharing the process later this week. 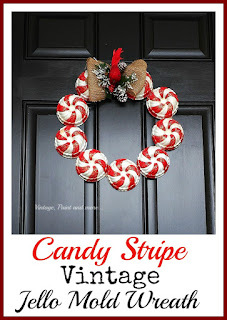 You can also see how I brought the pom-pom garland around and draped it over the letters giving it a little more interest. And with that the left side of the mantel is done. 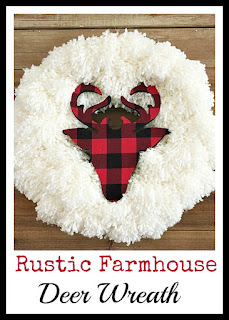 The next DIY project that I did is this yarn wreath with the buffalo check wood deer head. You can find the tutorial for it here. And, in case the buffalo check is not for you the fabric along with the color of the yarn can be changed to what would match your decor. The center of the mantel is now done. Only the right side left to finish. With a little careful shopping you can find some really cute pieces that just scream rustic farmhouse this year. I found the little buffalo plaid moose at the dollar store. His head and legs are wood and he stands on a wood base. The skis I found at Target in the Dollar Spot a couple of years ago. So cute and rustic. I then placed one of my Old World Santa's here. I have been collecting Old World Santas for many years and at one time had over 100. I have whittled it down to just a few and only display about 5 of them. This one is one of my favorites - he is so rustic and fits in well with this year's theme. I love the fact that he is carrying a set of snowshoes. Some more rustic goodness to tie in with the theme. Here's another view of the mantel and how all the elements come together to make a very rustic inspired farmhouse mantel. I feel like it would be perfect in a quaint little farmhouse set back in the trees next to a lake. Sitting on the floor in front of the fireplace is just a little more rustic farmhouse goodness. I placed a wood crate I stained and stenciled upside down on the floor so another Old World Santa could stand on it. Next to him is a grapevine tree I found at Old Tyme Pottery. I added a bit of berry garland I picked up at Target. 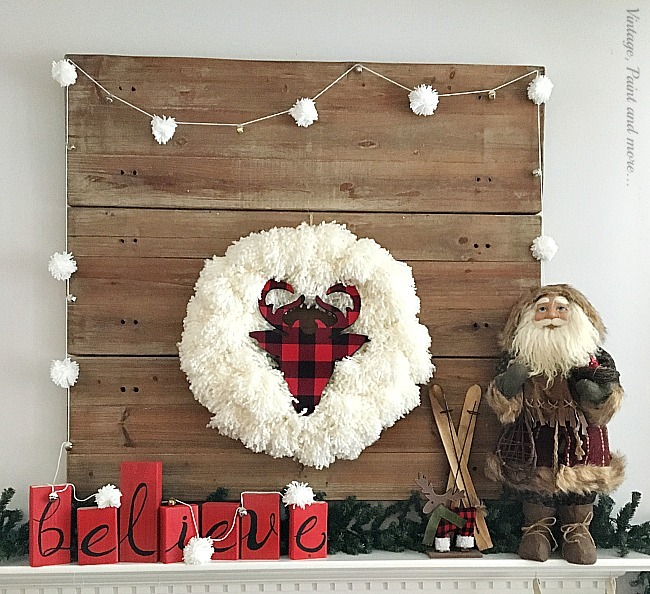 Standing next to this little vignette is my favorite this year - the cutest buffalo plaid deer I found at Hobby Lobby. I just love him - isn't he the cutest! To finish off this vignette I placed a wood Merry Christmas sign I found at the dollar store. What a perfect mix of rustic goodness. 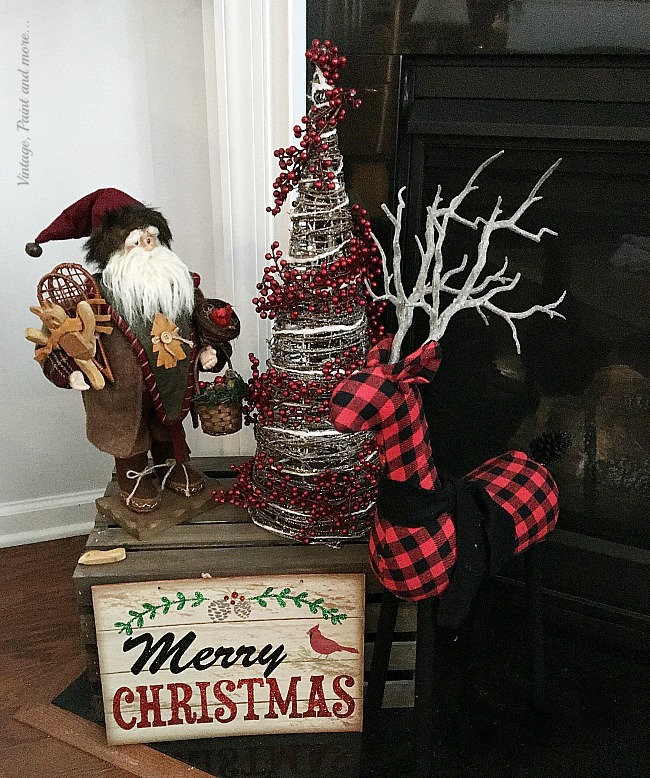 I am in love with this year's Rustic Farmhouse Christmas Mantel and will be showing you how I incorporated more rustic farmhouse fun in the rest of the family room and kitchen using things I had already and a few very inexpensive items I found. This just gives our room such a warm and cozy feel I can't wait to share it with you. What are you doing this year? Do you decorate in neutrals, traditional Christmas, or something a little out of the ordinary? I love to hear from you and would love for you to tell me about your decor in the comments below. I will be joining the parties that are listed on the Where I Party page. 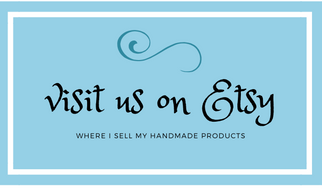 Please be sure to visit these great parties where you'll find some awesome projects and inspiration. Welcome, Jilllian and thank you for your sweet comments. So glad you stopped by. 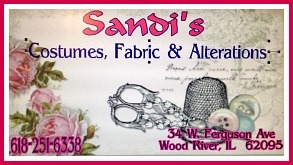 Thank you Kristin for stopping by and for following me on Facebook and Pinterest. I am going over to follow you now. 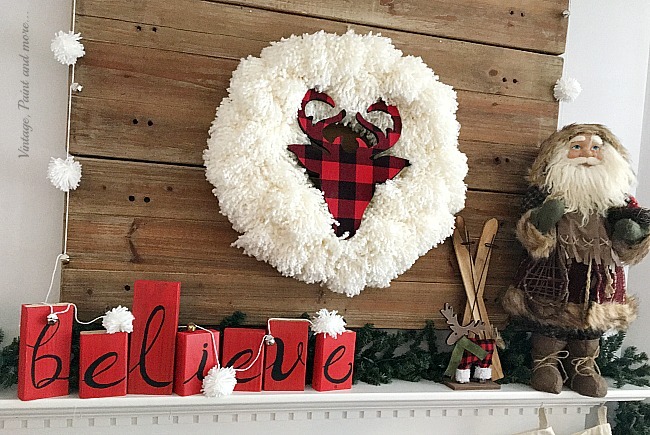 Very creative changes for your mantel. I do love the wooden backdrop that you use to make your new mantel. Nice work. Thank you so much Kathleen. And, thank you for stopping by. Thank you, Lynda. I'm sorry to hear about your Santa - hope you are able to get him back in tip top condition. Thank you for hosting each week. Your mantel is so cute, Cathy! Thanks for sharing at Vintage Charm! 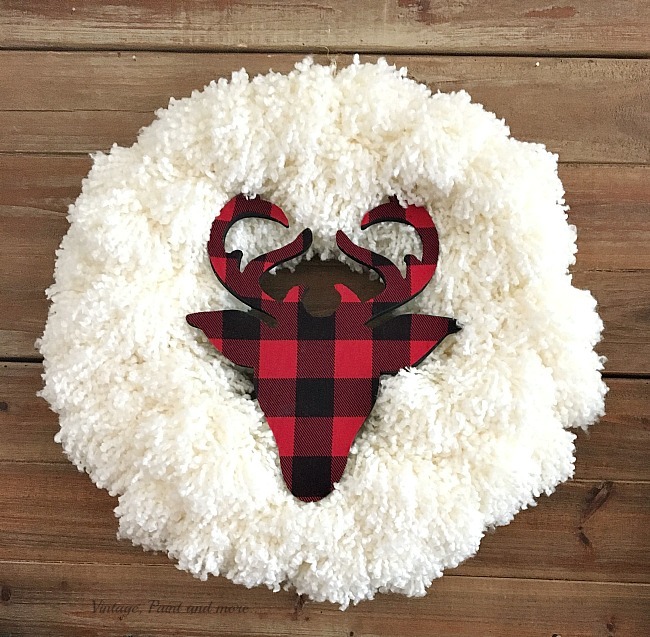 All those elements really do come together beautifully and your wreath with the deer head is really stunning. I also like Santa by the side.